*Contains all the quality equipment needed for cutting, welding and brazing in a rugged surrounding, plastic carrying case. A light to medium duty portable outfit that is extremely popular for general maintenance work, metal sculpture, automotive repair, air conditioning, refrigeration, etc. 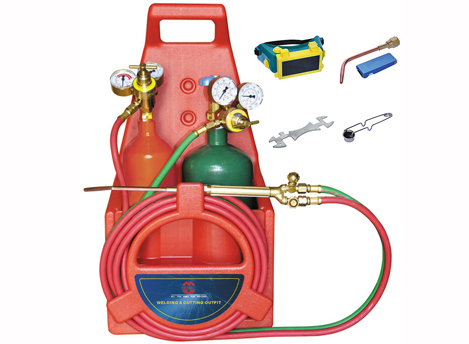 The carrier is made of tough, lightweight polypropylene and is designed to carry one "MC" acetylene cylinder, one "R"(20 cu.ft) oxygen cylinder, and apparatus.